This page will discuss the internals of PDF documents and those internal map to PDFBox classes. Users should reference the javadoc to see what classes and methods are available. The Adobe PDF Reference can be used to determine detailed information about fields and their meanings. 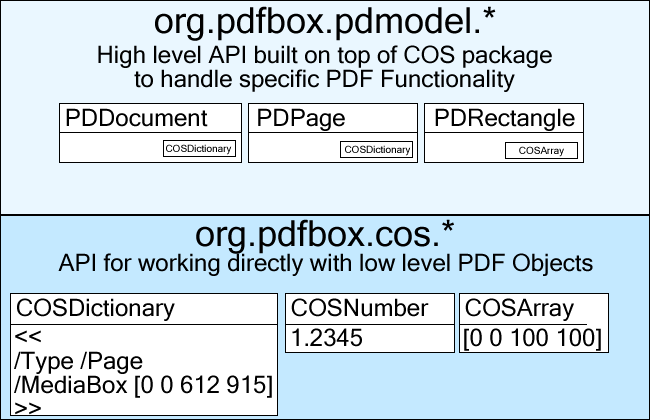 The COS Model allows access to all aspects of a PDF document. This type of programming is tedious and error prone though because the user must know all of the names of the parameters and no helper methods are available. The PD Model was created to help alleviate this problem. Each type of object(page, font, image) has a set of defined attributes that can be available in the dictionary. A PD Model class is available for each of these so that strongly typed methods are available to access the attributes. The same code from above to get the page width can be rewritten to use PD Model classes. PD Model objects sit on top of COS model. Typically, the classes in the PD Model will only store a COS object and all setter/getter methods will modify data that is stored in the COS object. For example, when you call PDPage.getLastModified() the method will do a lookup in the COSDictionary with the key “LastModified”, if it is found the value is then converter to a java.util.Calendar. When PDPage.setLastModified( Calendar ) is called then the Calendar is converted to a string in the COSDictionary. Here is a visual depiction of the COS Model and PD Model design. This design presents many advantages and disadvantages. For example, each call to PDPage.getMediaBox() will return a new PDRectangle object, but will contain the same underlying COSArray.